Locomotive À Vapeur HO Märklin 231 Br 18 128 de la Deutsche Reichbahn. Märklin 37330 Locomotive Électrique Série BB 12000 SNCF "
DIECAST DSB DIESEL LOCOMOTIVE. MARKLIN HO SCALE 3067. And this is a very reasonable fee to ensure your item arrives safe and sound and intact! ENGINE TESTED, RUN BOTH DIRECTIONS WITH WORKING DIRECTIONAL LIGHT. DIECAST SET800 ELECTRIC ENGINE. And this is a very reasonable fee to ensure your item arrives safe and sound and intact! ENGINE TESTED RUN BOTH DIRECTIONS WITH WORKING DIRECTIONAL LIGHTS. MARKLIN HO SCALE 3184. And this is a very reasonable fee to ensure your item arrives safe and sound and intact! SBB/CFF/FFS DIE CAST AM4/4. DIESEL ENGINE. ENGINE TEST: RUN BOTH DIRECTIONS WITH WORKING DIRECTIONAL LIGHT. Condition:Stunning looking, near mint loco! Super Condition! That's all. About new! Almost impossible to find in this typical condition. The original box is included, the box looks fair to good. And this is a very reasonable fee to ensure your item arrives safe and sound and intact! DIE CAST COVERED GOODS FREIGHT CAR. CONDITION : EXCELLENT CONDITION WITH ORIGINAL BOX, BOX SHOWN MINOR SHELF WEAR. Die-cast flatcar and Tractor load. DIECAST OBB GREEN ELECTRIC ENGINE. MARKLIN HO SCALE 3036. And this is a very reasonable fee to ensure your item arrives safe and sound and intact! USED IN VERY GOOD TO EXCELLENT CONDITION, WITH ORIGINAL BOX AND INSTRUCTION, BOX SHOWS MINOR SHELF WEAR. Marklin AC HO German Heavy DB V-220 DIESEL LOCOMOTIVE Diecast Metal C-9 MIB`80! Check the below details! 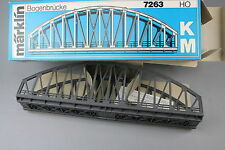 -Railtype: Original AC, 3-Rail Use (Marklin's Own!). 100% Top Mint Condition! Maybe testrun ONLY! The wheels are super clean as is the body. No rubbing wear. Never been used! It is in very good condition, there is no decomposition or cracks. The only issue is that the interior gray paint is flaking. Sorry we do not have the original box. This is the last version of this car. Releaed in 1939! They where rebuilt from the famous 01, 03 and 05 Steam locomotives! Scale: HO, 1:87 (First issued in the late `60ties, these where slightly bigger made, so will fit OO scale aswell!). English spoken. Thx for looking! Die-cast truck and Flat car. Check the below details! ALL Original! With Wrapping! -Railtype: Original AC, 3-Rail Use (Marklin's Own!). Good to very good looking model, with visible playwear. The model is still in very representative condition. Marklin HO 1:87 AC BR-03 STREAMLINED WAR STEAM LOCOMOTIVE Diecast MIB`80 RARE! Released in 1939! They where rebuilt from the famous 01, 03 and 05 Steam locomotives! Scale: HO, 1:87 (First issued in the late `60ties, these where slightly bigger made, so will fit OO scale aswell!). Has Box - worn a little on edges but still great condition. Marklin HO 1:87 AC BR-03 STREAMLINED WAR STEAM LOCOMOTIVE Diecast MIB`68 RARE! 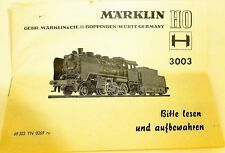 Marklin AC HO 1:87 German DB BR-23 STEAM LOCOMOTIVE Diecast Metal C-8 NMIB`76! Check the below details! Condition: Near Mint, Upgraded Condition! The model appears to be slightly used! It hardly shows any wear. The model was equiped with Red Taillights on the Tender! The wheels are super clean as is the body. Marklin AC HO 1:87 German DB BR E-141 ELECTRIC LOCOMOTIVE Diecast Metal NMIB`78! Hardly any signs of use, a fe very slight rubbing spots, you hardly see these. No paintloss. You will love it! Be keen on this seldom seen treasure! A stunning model for the real Marklin die-hard! Marklin Primex AC HO German DB BR-23 STEAM LOCOMOTIVE Diecast Metal C-8 NMIB`85! These models where less detailed without painted body details! Condition: Near Mint Condition! The model appears to be slightly used! The wheels are super clean as is the body. It's the genuine old moulding! Marklin AC HO German Heavy DB V-200 DIESEL LOCOMOTIVE Diecast Metal C-7 NMIB`70! Check the below details! -Railtype: Original AC, 3-Rail Use (Marklin's Own!). German DB (Deutsche Bundesbahn) Baureihe BRV-200 027, Heavy Diesel Locomotive! Model with DB Signing at both sides! Color Scem e: DB Red/Black. Marklin AC HO 1:87 German DB BR E-41 ELECTRIC LOCOMOTIVE Diecast Metal NMIB`80! Condition: A Stunning Loco! Very Nice! It shows slight playwear but nothing serious. A few tiny scratches here and there. No paintloss at all! You will love it! Be keen on this seldom seen treasure! Two rail, used with rubs and nicks. MÄRKLIN TWE 12930 ( 20 volts ) avec boite et mode d' emploi. Ech O.